Home Leisure Direct carries a great range of American two-piece Pool cues from the world’s best brands. In stock now for free delivery to the UK. Home Leisure Direct is proud to carry a huge range of 2-Piece American pool cues. Like all American cues, 2-piece pool cues feature a large plastic ferrule and leather tips suitable for playing American Pool or 9-Ball. 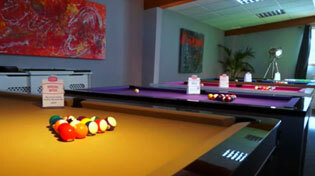 American pool tables differ from English tables in a few key ways, the most obvious of which is the pocket size. American pool pockets are larger, and as a result the game is played with slightly larger balls than English pool. American pool cues are larger, to compensate for this difference, giving you more precision in your shots. All of our American pool cues come with free delivery to mainland UK. However, for locations outside the UK mainland there may be an additional charge depending upon your exact location. Please call our friendly customer service team on 0800 622 6464 for a quote.